Kenya has a long history of farming and trade, with the coastal zone home to many Swahili city-states that were trading with the Arab world at least 2000 years ago. In the 17th century the Swahili coast came under Arab rule, and a slave trade expanded. In the late 19th century first German then British colonial powers took control. During the British colonial period, plantation agriculture, particularly coffee and tea, was developed in the central Highlands, while indigenous landless farmers were displaced to cities. From 1952 to 1959 Kenya saw widespread conflict during the Mau Mau uprising against British rule. Kenya became independent in 1963. Kenya’s post colonial history has included periods of political, civil and military instability, most recently notably post-election violence in 2007. Kenya’s economy is East Africa’s largest, and is dominated by the service sector. Much of this is tourism, which relies heavily on Kenya’s diverse ecology. Agriculture is also a major livelihood activity for much of the population, including large and small scale pastoralism, particularly in semi-arid zones, and is a major employer and contributor to export income, particularly tea, coffee and more recently fresh flowers. However, Kenya still has a low Human Development Index. Kenya relies on both surface water resources, from rivers, lakes and dammed reservoirs; and on groundwater. Dependence on groundwater is highest in rural areas and in the coastal zone, where urban areas also rely on groundwater. Access to improved water supplies in rural areas remains low, and in urban areas actually reduced from 92% in 1990 to 82% in 2015. Kenya has experienced periodic droughts, including a severe drought in 2011 after two failed rainy seasons. Please cite this page as: Barasa, Crane, Upton, Ó Dochartaigh and Bellwood-Howard, 2018. Kenya ranges in elevation from sea level to over 5500 m, and can be divided into a number of physiographic units, including the the coastal belt and plains; plateaux; plains; highlands (western and eastern); and the Kenya Rift Valley. Kenya. Map developed from USGS GTOPOPO30; GADM global administrative areas; and UN Revision of World Urbanization Prospects. For more information on the map development and datasets see the geography resource page. Kenya's climate varies from almost equatorial to high alpine. 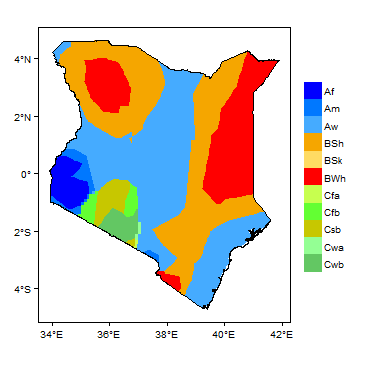 More information on average rainfall and temperature for each of the climate zones in Kenya can be seen at the Kenya climate page. Kenya's main rivers originate in the central highlands or in the southern foothills of the Ethiopian highlands. The Rift Valley is a dominant control on surface water flows. West of the Rift Valley, surface water flows towards Lake Victoria and into the Nile Basin; east of the Rift Valley, surface water flows southeast to the Indian Ocean. For the water resource management purposes, five main catchments are identified: Lake Victoria basin, Rift Valley basin, Athi river basin, Tana river basin and Ewaso Ngiro river basin (Pavelic et al. 2012). These large basins are in turn subdivided into 52 main basins and sub-basins (United Nations 1989). Major surface water features of Kenya. Map developed from World Wildlife Fund HydroSHEDS; Digital Chart of the World drainage; and FAO Inland Water Bodies. For more information on the map development and datasets see the surface water resource page. The major soil types in Kenya are solonetz, luvisols and cambisols. 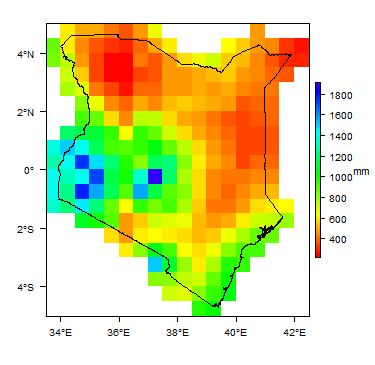 Soil Map of Kenya, from the European Commission Joint Research Centre: European Soil Portal. For more information on the map see the soil resource page. There are a number of distinct ecological zones in Kenya, including Alpine grasslands at high altitudes; humid to dry sub-humid zones; semiarid zones; and arid zones. 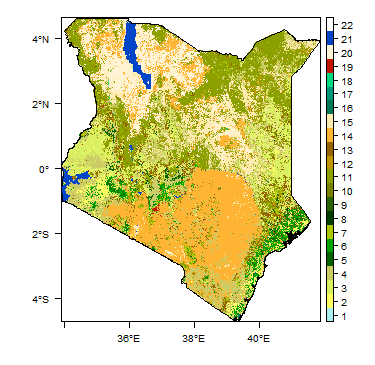 Land Cover Map of Kenya, from the European Space Agency GlobCover 2.3, 2009. For more information on the map see the land cover resource page. This section provides a summary of the geology of Kenya. More detail can be found in the references listed at the bottom of this page. Many of these references can be accessed through the Africa Groundwater Literature Archive. Baratamu Formation (Miocene-Eocene); Marafa Formation and Magarini Sands (Pliocene); Kilindini Formation (Pleistocene); and Recent deposits Tertiary-Quaternary Sedimentary deposits are common in various parts of Kenya, usually occuring at the base of, or intercalating with, volcanic successions, or deposited in tectonic troughs. The repeated faulting of the Rift Valley floor and the numerous volcanic eruptions created many short-lived basins with internal drainage in which lacustrine and fluviatile sediments accumulated. Sediment types include soils; alluvial and coastal beach sands and dune sands, evaporates, fossil coral reef and lagoonal formations and coastal sandstones; and alluvial and lacustrine sediments in the Rift Valley. Most of these sediments are unfossiliferous, but a few are of interest as they contain deposits that bear artefacts and interesting fossils that have been studied extensively. The more important sediments of middle Pleistocene are the Olorgesaillie lakebeds, a lacustrine series with much diatomite, mammalian fossils and artefacts. This is also comparable to the Kariandusi sediments near Gilgil and the Kanjera Beds in the Kavirondo Gulf off Lake Victoria. Olorgesaillie beds and Kariandusi sediments occur in the Rift Valley. Some early Tertiary formations do not crop out at the ground surface. Tertiary-Quaternary Volcanic rocks cover the central parts of the country from south to north, occurring in the floor of the Rift Valley and on the peneplains west and east of the valley. The oldest are of Lower Miocene age and comprise the eroded lavas and pyroclastic piles of South Nyanza. Late in Miocene times, Kapiti and Yatta phonolites were erupted and flowed to great lengths. Further eruptions accompanied by faulting persisted and also gave rise to the Rift Valley and the volcanic piles of Mounts Kenya, Elgon and Kilimanjaro. Quaternary volcanism was mostly within the Rift Valley and has given rise to the craters and cinder cones that are found in the floor of the valley, e.g. Longonot, Menengai and Suswa. Mtombku Formation (Jurassic-Cretaceous); Kambe Limestone & Mazeras Formation (Jurassic); Mariakani Sandstone (Triassic); Maji-ya-Chumvi (Permian-Triassic) and Taru Grits (Permian) Mesozoic-Palaeozoic Palaeozoic and Mesozoic formations in Kenya are found near the coast and in the northeast. The oldest of these rocks include the Taru, Maji-ya-Chumvi, Mariakani and Mazeras formations, which are dominantly sandstones, shales and siltstones, and form the Duruma series - equivalent to the Karroo system in southern Africa. They extend for about 100 km from Taru to Mazeras, west of Mombasa. Younger rocks occur in two separate areas, in the northeast of Kenya and along the coastal belt. The sratigraphy and fossils in the two areas are very distinct and it is likely that the sedimentary basins in the two areas were connected. Revision mapping in the area has come up with interesting lithological units that have revised lithological names. They include limestones as well as sandstones, siltstones and shales, including the Kambe Limestone and Mtombku Formation. The rocks of the Duruma series between Taru and Mazeras dip very gently towards the ocean and are heavily faulted in places. Bukoban system and Mozambique Belt Proterozoic The Kisii series of the Bukoban system comprises metamorphosed volcanic rocks with metasedimentary rocks. The Mozambique belt is a structural unit within which a wide variety of metasedimentary and meta-igneous rocks are found, with a broad concordance of structural style and metamorphic history. The degree of deformation is intense in most of the rocks, and they are of high metamorphic grade. They were referred to in earlier literature as basement system rocks, due to the high degree of metamorphism and deformation. Recent work on the Mozambique Belt has shown that rocks can be sub-divided into groups of contrasting lithology, structure and composition of igneous rocks content. Rock types include quartzites, biotite/hornblende gneisses, schist, granitoid gneisses, amphibolites and migmatites, and there are intrusions of syntectonic granites. These groups are being studied in greater detail in order to come up with proper chronostratigraphic terminology. Within the Mozambique Belt, basic igneous complexes range in size from bosses to small dykes. They occur both east and west of the Rift Valley. Some of the older basic intrusions have undergone deformation and metamorphism to give orthoamphibolites and charnockitic gneisses. Basic and granitic intrusions are known in the Mozambique Belt. The majority of Mozambique rocks have been placed in upper Precambrian (Proterozoic). The most characteristic feature of the Mozambique Belt is its structural trend, which is more or less north-south across the entire belt. Variations of the northerly trend are minor and when observed can be explained and are localised. Kavirondian and Nyanzian Archaean The Nyanzian and Kavirondian systems forming the Nyanza Craton are the oldest rocks in the country, with ages over 2,500 million years. The Nyanzian system is mainly composed of lavas and pyroclastics with minor sediments (including shales and cherts) and banded ironstones. The Kavirondian, which rests uncomfortably on the Nyanzian, consists of grits, sandstones, mudstones, greywackes and conglomerates. Numerous granitic bosses and batholiths have intruded the Nyanzian and Kavirondian. There are more Kavirondian intrusions, but pre-Kavirondian intrusions are also widespread, and the two systems are discernible. Both the Nyanzian and Kavirondian systems are isoclinally folded about axes that have an east-westerly trend. Kavirondian, is only slightly younger than Nyanzian but folding in the two systems has similar orientation. This section provides a summary of the hydrogeology of the main aquifers in Kenya. More information is available in the references listed at the bottom of this page. Many of these references can be accessed through the Africa Groundwater Literature Archive. The hydrogeology map on this page shows a simplified version of the type and productivity of the main aquifers at a national scale (see the Hydrogeology Map resource page for more details). The map is available to download as a shapefile (.shp) for use in GIS packages. The following summary classifies Kenya's aquifers differently, by their geological environment, which controls the way in which groundwater occurs and behaves in the different aquifers. Some of the strategic and major aquifers listed above are described in more detail, and information is provided on some of the poorer aquifers which nevertheless may form a local resource. Lotikipi and Lodwar aquifers Alluvial sands and sediments, which range up to 80 m deep. They can have high groundwater potential where dominated by coarse grained sediments (sand and gravel), but elsewhere, groundwater potential is typically limited. Groundwater in the Lotikipi aquifer is very saline, with conductivity values exceeding 8000 uS/cm. Recharge occurs both by direct rainfall infiltration and, to the Lodwar aquifer, by leakage from the River Turkwel. Tiwi aquifer Small outcrop but strategically important in the Kwale area. It is also termed the Kilindili Sands. The lithology is alluvial and lacustrine sand and clay and is typically not more than 70 m deep. The aquifer is semi-confined or confined, with water levels 25 to 30 mbgl. High borehole yields can be obtained, and boreholes are typically 40 – 80 m deep. Transmissivity values range from 120 to 600 m²/d, and storage coefficients from 9.3 x 10-³ to 8.0 x 10-². Typically good quality. Vulnerable to saline intrusion. Recharged from groundwater flow from the west and possibly also by leakage from seasonal swamps and lakes directly overlying the aquifer. Gongoni/Msambweni Aquifer The Gongoni/Msambweni Aquifer occurs in the Kwale area. High yields can be obtained. Boreholes are typically 40 – 100 m deep. Generally good quality, apart from high iron concentrations. Recharge occurs by direct rainfall infiltration and also by leakage from the River Mkurumudzi. Baricho Aquifer The Baricho aquifer is small but strategic in the coastal zone and comprises approximately 20 m of alluvial sand and gravel overlying around 40 m of Jurassic Mazeras Sandstone and Kambe Limestone. Good borehole yields can be obtained, and boreholes are typically drilled to 25 – 60 m depth. The aquifer is semi-confined to unconfined, with vertical hydraulic conductivities between 75 and 500 m/d, inferring transmissivities of 3,750 to 25,000 m2/d for a saturated thickness of 50 m; specific yield ranges from 0.15 to 0.285 (Mumma et al. 2011). Generally good quality, sometimes elevated total dissolved solids (TDS). SEC ranges from 390 to 680 μS/cm. Recharge occurs dominantly by leakage from the River Galena. Merti Aquifer The Merti Aquifer occurs in Wajir County and comprises semi-consolidated clays, sands, sandstones and limestones . Groundwater is usually confined and water levels lie at 90 to 120 m below ground level. found at fairly uniform depths of between 110 and 180 m below ground level. The aquifer is thought to be between 80 and 280 m thick. Successful boreholes are commonly between 105 m to 150 m bgl (GIBB Africa Ltd 2004). Transmissivity ranges from 0.2 to 840 m²/d depending on the facies, with higher transmissivities in coarse grained materials. The median transmissivity is 275 m²/d (n = 20). Storage coefficients range from 4.3 x 10-5 to 6.7 x 10-4 (n = 6). The hydraulic gradient ranges from 0.001 in the western part of the aquifer, falling to 0.0001 to 0.005 toward the border with Somalia (Mumma et al. 2011). Locally subject to over-exploitation (Mumma et al. 2011) Highly variable. Freshest in the centre of the aquifer, becoming more mineralised to north and south (Mumma et al. 2011). Saline water has been observed in the Merti aquifer and is also believed to underlie the fresh water layer. Water quality in the Dadaab refugee camps has deteriorated over time, mainly due to increasing salinity. In Habaswein there is evidence of some salinisation as a result of long term abstraction (Mumma et al. 2011, Oord et al. 2014). Modern recharge is limited; most abstraction is of fossil water (Mumma et al. 2011). Key references for these aquifers are Acacia Water, GIBB Africa Ltd (2004), Mumma et al. (2011) and Oord et al. (2014) (see Reference section, below). General volcanic aquifers The volcanic rocks in Kenya vary from a few metres to several hundred metres thick. Groundwater flow and storage occur in fractures and weathered zones, often along the sub-horizontal boundaries between successive lava flows, which at one time were land surfaces. Boreholes in the volcanic aquifers are up to 125 m depth, and may encounter more than five discrete aquifer layers. These aquifer layers are often confined. Yields, depth to aquifers and rest water levels vary significantly. A specific capacity value of 0.2 m³/hour/m is quoted (Pavelic et al. 2012, Ministry of Water Development 1992). An average yield of 7.5 to 7.6 m³/hour is quoted for boreholes in volcanic rocks (Pavelic et al. 2012, United Nations 1989), with a large drawdown of 37 m (Pavelic et al. 2012). A hydraulic conductivity value of 0.0144 m/d is quoted. Groundwater typically has low total dissolved solids and high bicarbonate. The volcanic deposits of the East African Rift System are rich in fluoride which leads to high groundwater fluoride concentrations. 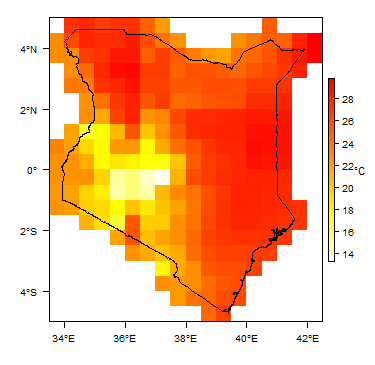 For example, concentrations over 10 mg/L were found in the Nairobi area (Coetsiers et al. 2008). Nairobi Aquifer The Nairobi aquifer is one of the most significant in Kenya. It comprises Plio-Pleistocene volcanics interbedded with old land surface and intervolcanic sediments, and underlies much of the Nairobi metropolitan area. It is a complex multilayered aquifer system, recharged along the eastern edge of the Rift Valley with groundwater moving toward the east. It is unconfined in the recharge zone, becoming confined towards the east. The main aquifer layer, the Upper Athi Series, is confined and typically found at depths of 120 to 300 m bgl. Transmissivity values range from 0.1 to 160 m²/d, with hydraulic conductivities ranging from 0.01 to 1.3 m/d. Storage coefficient values range from 1.2 x 10-4 to 4.2 x 10-1 (Mumma et al. 2011). Boreholes are typically drilled to 250 - 400 m depth. Overabstraction causing lowered water levels. Often shows naturally high fluoride. Recharge by rainfall infiltration on the Ngong Hills along the eastern edge of the Rift Valley. Kabatini aquifer The Kabatini aquifer occurs within the volcanic rocks of the Nakuru area. Boreholes are typically drilled to about 150 m depth. Elevated fluoride concentrations. A key reference for these aquifers is Coetsiers et al. (2008). An average yield of 4.4 m³/hour is quoted for boreholes in Precambrian basement aquifers (United Nations 1989). Some aquifers are identified as being impacted by overabstraction and/or water quality deterioration. WRMA is preparing a large scale map of groundwater stressed areas. The total potential groundwater resource (storage) in Kenya is estimated to be 619 million m³ (Pavelic et al. 2012). The total groundwater abstraction rate in in 2012 was estimated at 7.21 million m³/year, and the total safe abstraction rate (annually recharged) in Kenya is estimated to be 193 million m³/year (Ministry of Water Development 1992, Pavelic et al. 2012). Some aquifers are identified as being overabstracted with associated problems of water level decline and sometimes water quality deterioration, in particular the Nairobi volcanic aquifer. Some aquifers, mostly with recharge from fresh water rivers, are excellent groundwater sources e.g. the Lodwar Aquifer recharged by the River Turkwel; the Merti Aquifer recharged by the River Ewaso; the Gongoni Aquifer recharged by the Mkurumudzi River and the Baricho Aquifer recharged by the River Galena. Many aquifers have groundwater quality issues. For example, the Nairobi aquifer has high fluoride concentrations, which mostly exceed WHO standards, especially towards the Embakasi area. The Lotikipi Aquifer is very saline with conductivity exceeding 8000 µS/cm. The Mombasa Island Pleistocene sands and limestones and related aquifers are impacted by pollution and saline intrusion. The Mumias granites are impacted by pollution and salinisation. Poor sewerage and drainage systems are major contributors to groundwater contamination. This is an increasing problem in Nairobi and its environs. Open cast mining of stones pose a threat to groundwater as a result of contaminated water infiltrating into the ground. The Kiserian reservoir has suffered contamination problems due to inadequate sewage systems in nearby towns; this contaminated water may find its way into groundwater. Equally, groundwater may be becoming directly contaminated as a result of reliance on pit latrines and soakaway pits. River pollution by industrial wastes and sewage pose a great risk for groundwater protection. Many parts of Kenya rely on groundwater, either directly from privately owned or communal boreholes, or via piped supplies from groundwater wellfields. Groundwater from communal boreholes or hand dug wells supplies most of the rural population. Groundwater is used locally for mining, e.g. the Gongoni well field used for the Base Titanium mining company. The Daadab refugee camp depends on groundwater abstracted from the Merti aquifer. Most irrigation in Kenya is supplied by surface water, but groundwater supplies a small proportion of irrigation water. It is reported that although groundwater exploitation has considerable potential for boosting water supplies in Kenya, its use is limited by poor water quality, overexploitation, saline intrusion along the coastal areas, and inadequate knowledge of the occurrence of the resource (Mumma et al. 2011). Nevertheless, many areas of Kenya are reliant on groundwater sources for domestic, commercial and industrial needs, including the coastal zone which is almost entirely dependent on groundwater. Other areas include Mombasa and Malindi (which depend on the Baricho wellfield); Kwale (dependent on the Tiwi wellfield); and Wajir (dependent on the Merti aquifer); as well as Naivasha, Nakuru, Mandera, and Lodwar (Mumma et al. 2011). Water resources legislation in Kenya has gone through many changes in recent decades. After independence in 1964, the government defined water as a national good and began developing rural water supply schemes through local government councils, with support from international donors. Ambitious development of water schemes during the 1970s slowed at the start of the 1980s due to government budget constraints, and Kenya saw successive periods of centralisation and decentralisation of water supply management, with mixed success. Major changes in the water sector were seen following the Water Act of 2002, and in 2010 Kenya’s new constitution enshrined water and sanitation as a human right. Water regulation: to sustainably and equitably allocate water resources among competing needs, such as planning and issuing water abstraction permits, including permits for new water boreholes, and setting and collecting permit and water user fees. Water resource protection: to control pollution and improving water quality in Kenya's water bodies, including integrating land use activities and human activities into WRA Water Quality control programs. Information collection and dissemination: collecting, analysing, storing and dissemination information on water resources. This includes a requirement for borehole logs and test pumping data for all new water boreholes to be collected by borehole drillers/developers and returned to the WRA. Climate change adaptation: WRA has specific responsibilities relating to the control of water resources in disasters that have been brought about by climate change effects. Prior to the Water Act 2016, the Water Act of 2002 created the mechanisms for planning, including the establishment of the Water Resources Management Authority (WRMA), which had responsibility for regulating the ownership and control of water and making provision for the conservation of surface and groundwater and the supply of services in relation to water and sewerage (Mumma et al. 2011). In 2006, WRMA proposed a policy for the protection of groundwater (Mumma et al. 2011). The Ministry of Water and Irrigation (MoWI) is responsible for the development of water resource legislation, policy formulation, sector coordination and guidance, and monitoring and evaluation. WRMA instituted a monitoring program that targets most of the important Kenyan aquifers. The principal disadvantage of the monitoring network currently in place is that the majority of boreholes used are production boreholes and require water levels to return to static levels prior to the measurements. Mumma et al. reported in 2011 that eleven dedicated monitoring boreholes were being constructed in a variety of aquifers across Kenya, to be equipped with digital loggers. Across the whole network, WRA attempts to manually collect water level and quality trends quarterly, and for the more intensively used aquifers, water levels are monitored monthly. Water levels have been collected weekly to monthly in the Dadaab Merti by CARE Kenya since 1992, and constitute the longest continuous groundwater level data set in the country (Mumma et al. 2011). Water quality data are collected for a selection of groundwater sources. For the coastal aquifers, this includes pH, color, EC25, TDS, chloride, salinity, total alkalinity, total hardness, magnesium, and calcium (Mumma et al. 2011). The following references provide more information on the hydrogeology and groundwater resources of Kenya. Acacia Water. Hydrogeological Assessment of the Merti Aquifer, Kenya. Technical report no 1 of ARIGA. Assessing Risks of Investment in Groundwater Development in Sub-Saharan Africa. Blandenier L. 2015. 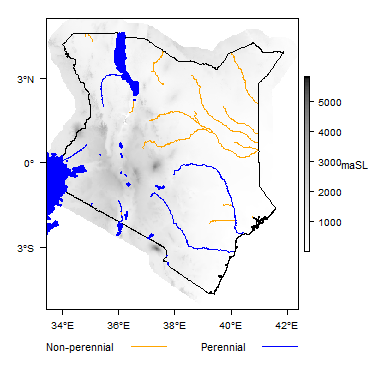 Recharge quantification and continental freshwater lens dynamics in arid regions: application to the Merti Aquifer (Eastern Kenya). PhD Thesis, University of Neuchatel. Blandenier L. 2016. The Merti aquifer (Kenya), a sustainable water resource for the Dadaab refugee camps and local communities? In: Shaw RJ (ed) Ensuring availability and sustainable management of water and sanitation for all: Proceedings of the 39th WEDC International Conference, Kumasi, Ghana, 11-15 July 2016. Foster T and Hope R. 2016. A multi-decadal and social-ecological systems analysis of community waterpoint payment behaviours in rural Kenya. Journal of Rural Studies, 47, 85-96. GIBB Africa Ltd. 2004. UNICEF Kenya Country Office - Study of the Merti Aquifer - Technical Report ISsue 2.0. IWMI. 2014. Transboundary Aquifer Mapping and Management in Africa. KNBS (Kenya National Bureau of Statistics). 2012. The 2009 Kenya Population and Housing Census. In: Analytical Report on Housing Conditions, Amenities and Household Assets, Vol. XI. Kenya National Bureau of Statistics, Nairobi. Mumma A, Lane M, Kairu E, Tuinhof A and Hirji R. 2011. Kenya: Groundwater Governance Case Study. Water Papers: Water Partnership Programme. Ministry of Water Development. 1992. The Study on the National Water Master Plan. Prepared with the assistance of Japan International Cooperation Agency (JICA). Oord A, Collenteur R and Tolk L. 2014. Hydrogeological Assessment of the Merti Aquifer, Kenya. Technical report No 1 of ARIGA, Assessing Risks of Investment in Groundwater Development in Sub-Saharan Africa. Pavelic P, Giordano M, Keraita B, Ramesh V and Rao T. 2012 . Groundwater availability and use in Sub-Saharan Africa: a review of 15 countries. International Water Management Institute. Republic Of Kenya Parliament. 2014. National Assembly Bills, The Water Bill (Bill No. 7of 2014). Sincat-Atkins/Groundwater Survey (Kenya) Ltd (JVSA/GSK). 1998. Second Mombasa & Coastal Water Supply Engineering and Rehabilitation Project - Tiwi Aquifer Development: Borehole Drilling and Associated Works; Borehole Completion Report. Volume I-III. Report for National Water Conservation & Pipeline Corporation, prepared by Joint Venture Sincat-Atkins in association with Groundwater Survey (K) Ltd. Nairobi, Kenya. Sosi B, Cheboi E and Simiyu C. 2013. Nonlinear Correlation analysis between Surface Resistivity and Hydraulic Characteristics of the Kabatini Well Field, Upper Lake Nakuru Basin, Kenya Rift. IOSR Journal of Applied Geology and Geophysics (IOSR-JAGG), Volume 1, Issue 6 (Nov – Dec 2013), 35-45. United Nations. 1989. Groundwater in Eastern, Central and Southern Africa: Kenya. United Nations Department of Technical Cooperation for Development. 2030 Water Resources Group. 2016. Understanding the Kenyan Water Act 2016. 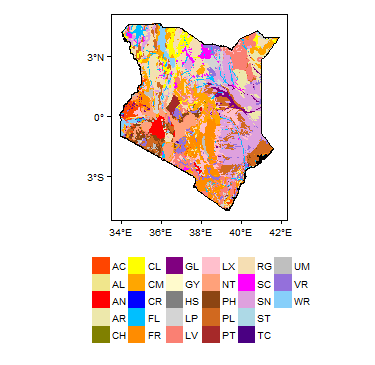 The Ministry of Mining sells geological maps and geological reports carried out by the Geological Survey of Kenya. The Water Resources Management Authority licences hydrogeological data (borehole logs, aquifer units and yields). The National Oil Corporation of Kenya (NOCK) licences their seismic data, seismic lines and oil well logs. The Samsam Water Foundation website includes hydrogeological information. The University of Nairobi offers a platform on its website on student research topics which provides useful geological information. The International Livestock Research Institute (ILRI) has digitized and shapefiles of Kenya Geology, soils and landcover. The 2030 Water Resources Group carry out work relating to water resources in Kenya and have produced a number of reports on the Kenyan water sector. This page was last modified on 18 February 2019, at 17:18.